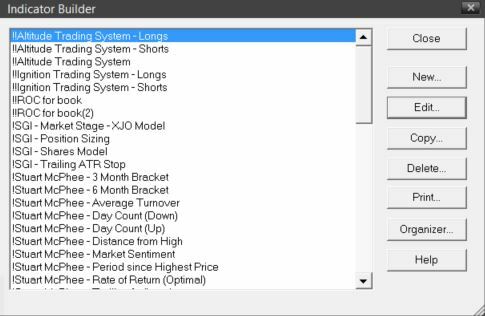 We believe that understanding The Indicator Builder is essential to using MetaStock. This component allows us to create our very own customised indicators. In this way, we can recreate indicators we may have seen in other charting applications, read about in books or seen in magazines. What’s more, once an indicator has been created, it’s accessed in the same manner, and has the same characteristics, as all the other pre-packaged MetaStock indicators. Not only can these indicators assist in our visual assessments of charts, but they can also form the basis of explorations, expert advisors and system tests alike. The best way to learn about The Indicator Builder is by way of example. Therefore, we’ll create an indicator describing the steps and menus along the way. Close: Closes the Indicator Builder dialog. New: Displays the ‘Indicator Editor’ dialog, which is used to create our custom indicator. Edit: Displays the ‘Indicator Editor’ dialog of the selected Indicator. This is used to alter an existing indicator. Copy: Makes a copy of the selected indicator, allowing us to rename it and change the original indicator. Delete: Deletes the selected indicator. Organizer: Displays the ‘Formula Organizer Wizard’. It enables us to import and export formulas from any of the four formula tools within MetaStock. 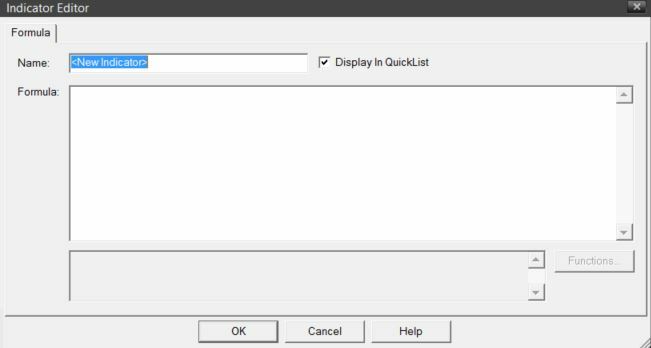 Help: Displays the help page on Indicator Builder dialog. The cursor will be in the ‘Name’ text box which is obviously where we name our custom indicator. To the right, there is a check box denoting whether or not we want our new custom indicator to be listed in MetaStock’s ‘QuickList’. As a general rule, we would want this box ticked. There is also a ‘Functions’ button available in the Indicator Editor. This allows us to paste the correct syntax of any function straight into any formula, which is a very handy feature. To the left of this, there is the ‘Formula’ text box which is where the actual coding for the indicator is placed. In our example we have used both the variable and input functions. The variable function allows us to assign a word to a particular expression, which can then be used in the formula. We have coupled this with the Input function, which will prompt the user to enter a value. Let’s examine our formula further. ‘periods’ is the word that is assigned to the expression. 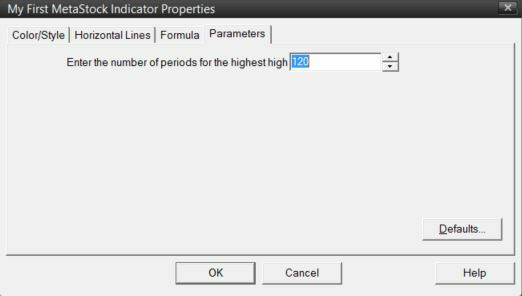 “Enter the number of periods for the highest high” is the text that will prompt the user to enter the value for ‘periods’. The three remaining values within the formula set the parameters for the value of ‘periods’. In our example, ‘1’ is the minimum value accepted; ‘9999’ is the maximum and ‘120’ is the default selection. Note that the semi-colon between the two expressions stipulates to MetaStock that they are separate. 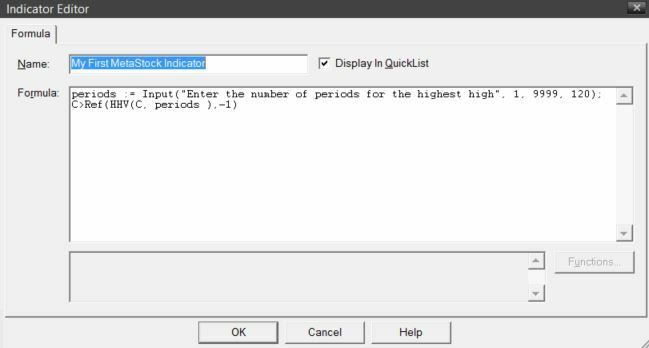 In other words, MetaStock first calculates the input function and then calculates the ‘Highest High Value’ function. Once the value has been inputted, MetaStock will calculate the formula and apply the results to the chart.